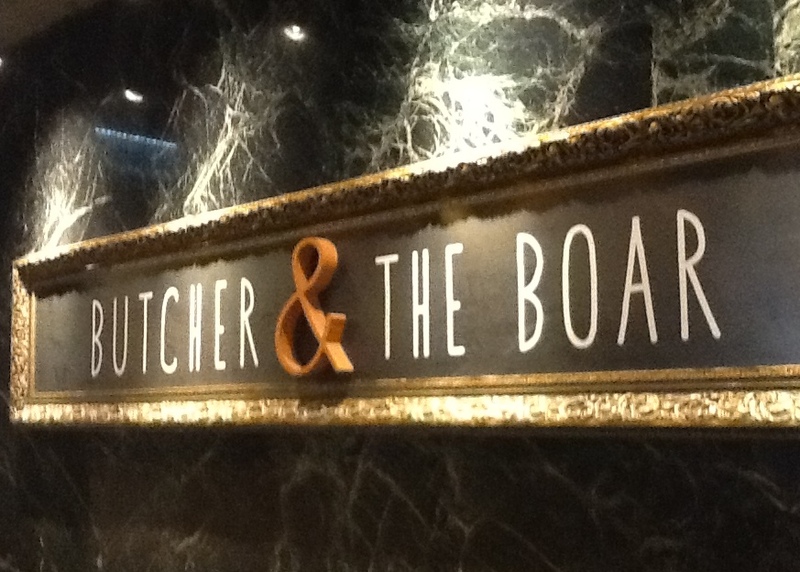 The Butcher & the Boar has been on my must-try list for a few months and with only one dinner in Minneapolis for this visit I decided to pull the trigger and make a reservation. Coincidentally, the James Beard Foundation announced its 2013 nominees that day and the Butcher & the Boar was nominated for Best Restaurant. Call it Karma, call it divine intervention or call it pure dumb luck, I call it a sign from the culinary forces that I made the correct choice. Driving through artic conditions of 5-degrees plus a stiff wind I was grateful when I arrived at 12th and Hennepin and saw valet parking on the side of the building, only accessible from 12th Street. Upon entering you are greeted by an enormous bar spanning the left wall, serving thirty beers on tap, a wide variety of wines plus an assortment of blended cocktails, with various cute names. There are a few tables to the left of the bar, sort of tucked away from the main action; some would say these are either the B-list tables or the quiet tables. I think these are a good choice for some quiet conversation. There is a single large table tucked into an alcove across from the bar on the way to the main dining area, which is large and open. The interior is very cool. The menu is broken into appetizers and salads, in-house prepared meats, plus entrées of meats, poultry and seafood. A separate menu of sides completes the options. I ordered the “Turkey Brunschweiger, Vidalia Onion Jam and Milk Stout Toast” for an appetizer, the “Double Cut Berkshire Pork Chop with Pineapple Rum Glaze, Macadamia Nut Salsa” as an entrée plus the “Skillet Cornbread.” All of these were recommended by the server, who was spot on in her knowledge and guided me through the menu and the sheer volume of food it represented, “these dishes are normally split” was her challenge. The appetizer arrived quickly. I was first impressed with the small glass jar that contained the turkey liver mousse, there was a small layer of fat on top, a great way to preserve as well as deliver added flavor, the Vidalia onion jam was neatly placed on the plate and the milk stout toasts arrived in a small, rectangular bowl. A small spoon protruded from the Brunschweiger and my first taste informed me that the night would produce some special flavors. It had an incredibly deep flavor, liver on overdrive, absolutely delicious. Placing a small amount on the toast and then topped with just a touch of the onion jam created an extraordinary balance of flavors and textures. The smooth, richness of the mousse, the sweet jam and the slight bitterness of the toast perfectly complemented each other. Now the fun began as I played with various combinations. I found that placing the jam on the toast and then the jam gave a slightly different flavor profile and then placing the two toppings side-by-side implanted even a slightly different flavor profile. The one consistent feature was that each bite was fantastic. When the pork chop arrived I sat in awe. This was the largest pork chop that has ever graced my plate. It was 3-4” in height, sitting proudly in the pineapple sauce, with the nut salsa perched on top. The size would rival any NY steak house. I carefully sliced the longer arced side so my first taste would contain both meat and just a touch of fat. The meat was incredibly moist, served medium, slightly pink throughout, and the texture was perfect. The first bite confirmed my thought from the appetizer; the flavors for the evening would be extraordinary. This was an incredible piece of meat, first brined, so the saltiness was evident, but smokiness was the primary flavor; and this was Berkshire pork, known for juiciness, fat content and fully capable of handling the long and slow cooking processes. 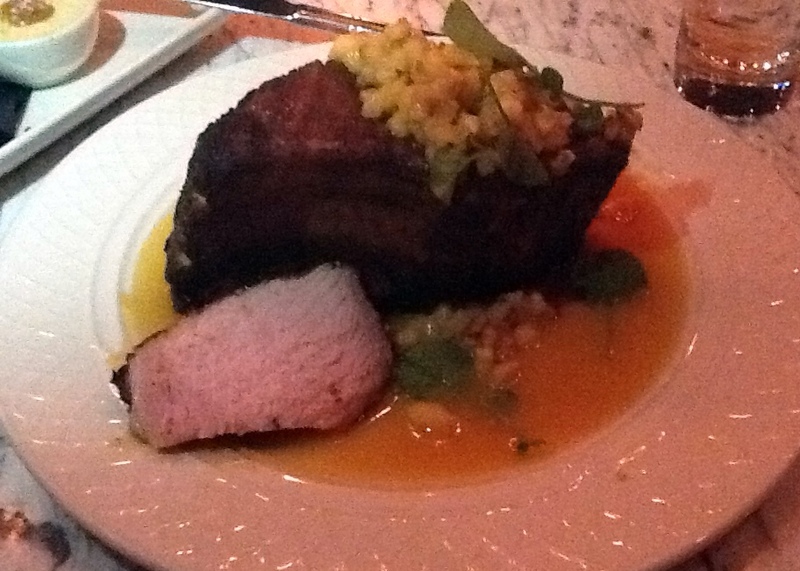 The sweetness of the pineapple rum glace was a perfect complement to the salty-smokiness of the pork, Texas meets Hawaii. As much as the Macadamia nut salsa delivered great flavor contrast, the soft texture of the Macadamias was not to my liking, I would have preferred more crunchiness. The skillet cornbread was nothing special; in fact mine was a little burnt on the bottom. The flavor was basic, there was no textural contrast (I prefer the inclusion of corn kernels) and the depth of flavor was not present. If not for the addition of butter, I would classify the cornbread as dry. With the other choices available I would recommend going in a different direction on the side. Service was excellent. My server knew the menu, was willing to make recommendations, understood the size of the dishes and guided me to a more reasonable order. The one major drawback was the pacing. I am not sure if this was caused by my dining solo, but the appetizer arrived within minutes after the order was placed and the entrée arrived within one minute of my finishing the appetizer. I felt incredibly rushed. There was no time for relaxing, digesting or just contemplating. I prefer a 5-10 minute interlude as a single and 15 minutes as a couple or group. Hopefully this was the exception, not the rule. Overall the two main components of the meal were outstanding. The appetizer was extraordinary and the pork and sauce were perfect, but given the salsa, cornbread and the pacing, there is still room for improvement. 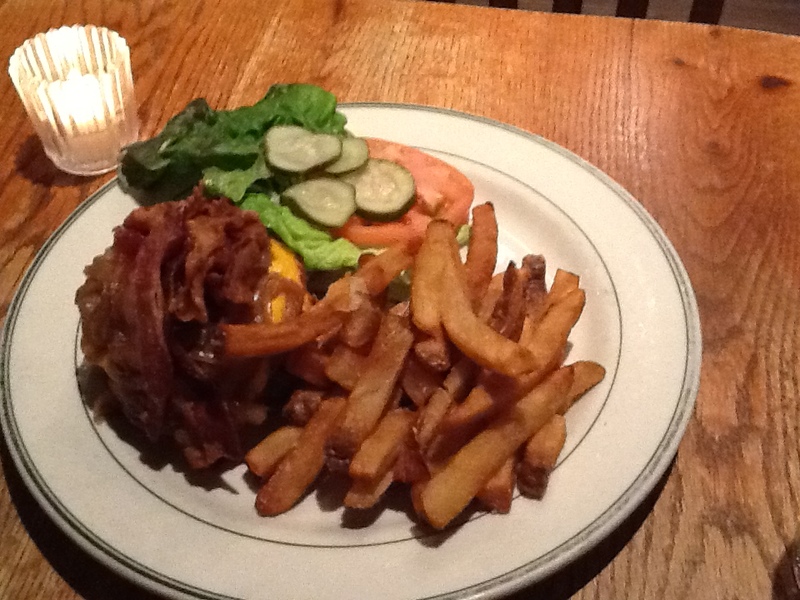 I had high hopes when I entered the Gingerman for a quick burger. The menu was diverse and I thought they were spot on with many of the options. So as I sat in front of the fireplace in the rear room, I thought this might be another addition to my Power Rotation. Unfortunately the ingredients and execution did not meet these expectations. 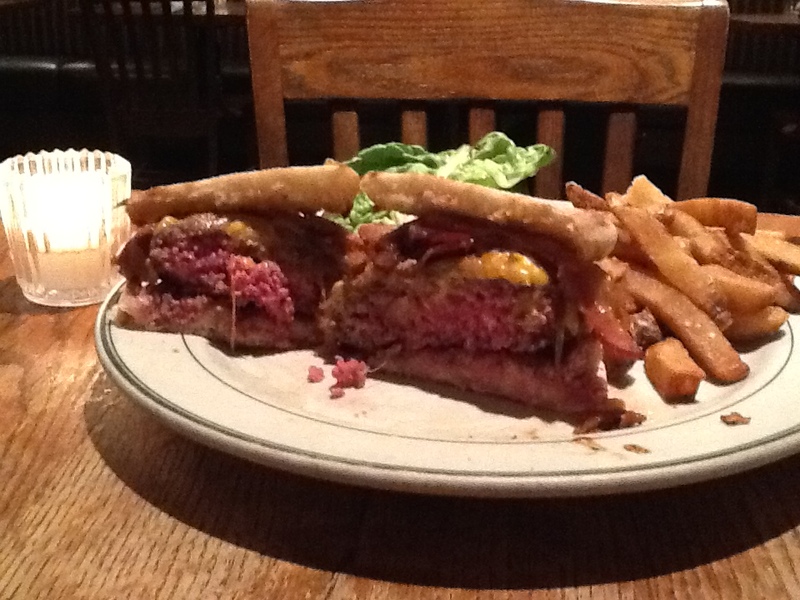 I ordered the Gingerman Burger with bacon, American cheese and caramelized onions. This is served on an English muffin with fries. The kitchen prepared the burger perfectly to my requested medium rare. It looked like a great burger when it settled in front of me. My first bite of the meat was disappointing. It was totally unseasoned, with very little meaty flavor. The bacon was very good, crispy and freshly prepared and the onions were soft and medium flavor, very good but not great. The muffin lost the battle of the juice, it fell apart. This would be a positive if the meat flavor was deeper. The fries were excellent. I really liked them. I am not sure of the potato’s variety, but the texture was dense, while soft from the deep fryer. They were also perfectly salted. The fries were the highlight of the visit. OK I am a Sally’s lover for 30 years but after hearing so many great things about Pepe’s, I decided to give the Fairfield location a shot. Yes it is a very good pie, no doubt but I will not place above Sally’s, by any stretch of the imagination. First the place is very relaxing and if you get a seat in the front room you can watch the pizza maker use the 10-foot pizza peal to retrieve pizzas from the back of the oven. The crust is excellent, but again not as good as Sally’s and the toppings were average, nothing special. The glasses for the drinks are a joke, the one I use in my bathroom in the morning is larger. This is basically poking my eye with thinking that a scalding hot pizza should be served with a 5-ounce glass of soda. Overall I give Pepes a good solid 8, but this Sally’s lover with stay loyal. Frontera Grill is one of those places that you just have to experience and on my culinary Bucket List. Rick Bayless, the Owner / Chef is one of the greatest, if not the greatest, modern Mexican Chef and a perfectionist in every dish he creates, an icon to many. Frontera Grill, along with its slightly more formal sister Topolobampa, occupy 445 North Clark St and grabbing a table is not an easy task. Reservations are only accepted in Topolobampa and are snatched weeks in advance and they are not accepted, or extremely limited, at Frontera. Waits as a walk-in can exceed multiple hours (I was once told the wait would be 2½ hours as a single). When my meetings ended early, I thought this might be my lucky day so I gave it a shot. I arrived at 445PM, the temperature was 5 degrees with the wind chill garnered that elusive minus sign and waited at the door for the appointed hour. Promptly at five the door was unlocked, I gave my name to the hostess, received my beeper and proceeded to the bar area. I was first in line, a twenty minute wait in the incredibly cool bar and I would have a table. Since I wanted to snap some photos without a flash on my I-Pad (dinner was not planned so camera stayed home) I chose the main dining area, with much better light and a view of the open kitchen. My server was fantastic. Donning a handle bar mustache, he walked me through the menu, his favorites and answered several of my questions. As I ordered, one end of the mustache raised a touch and he asked, “how hungry are you?” That is the signal that I have ordered exactly the number of dishes that I should, in this case (1) Duck Tacos al Carbón; (2) Goat Barbacoa Enchiladas; and (3) Shrimp in Chilachole (the server’s number one choice). 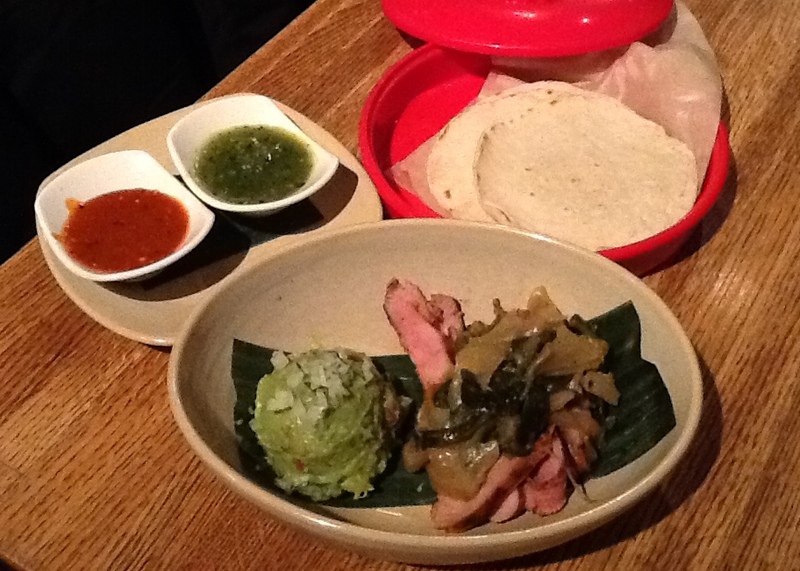 The Tacos al Carbón included a plate of wood-grilled duck with roasted poblano rajas, guacamole, two salsas with a container [get name of container] of four soft tacos. 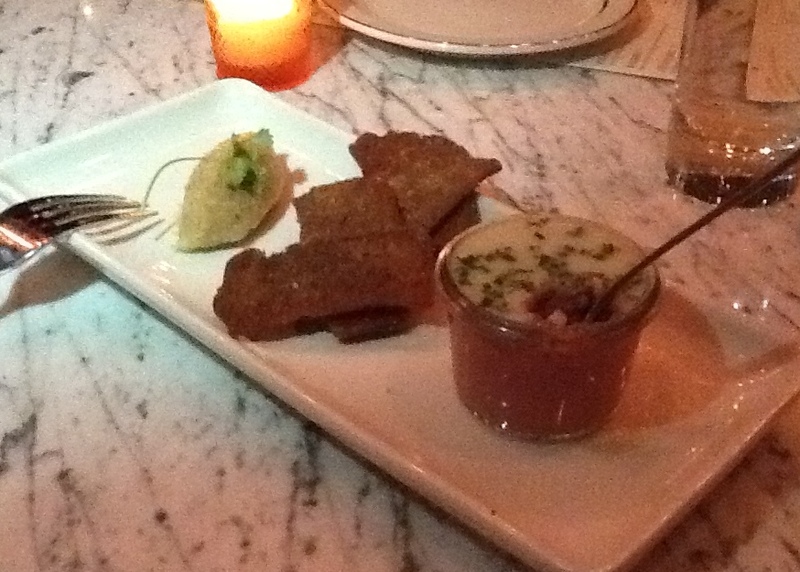 A scoop of guacamole shared the plate with the duck. My first taste was the guacamole, and it was like none I have ever eaten. It was soft, creamy with nice pieces of tomato and onion, which carried some spiciness. The duck was succulent and full of flavor. I played the first taco safe with some of the red sauce and then kicked it on numbers 2 & 3 with the green. The dish set the bar very high after round number 1 of the night and I knew I was in for more than something extraordinary. Goat Barbacoa Enchiladas included slow-cooked Kilgus goat barbacoa, “black” pasilla sauce, añejo cheese, and crunchy jícama-olive salsa. From the inside out… the goat was perfectly spiced to medium heat and was moist, and delicious. 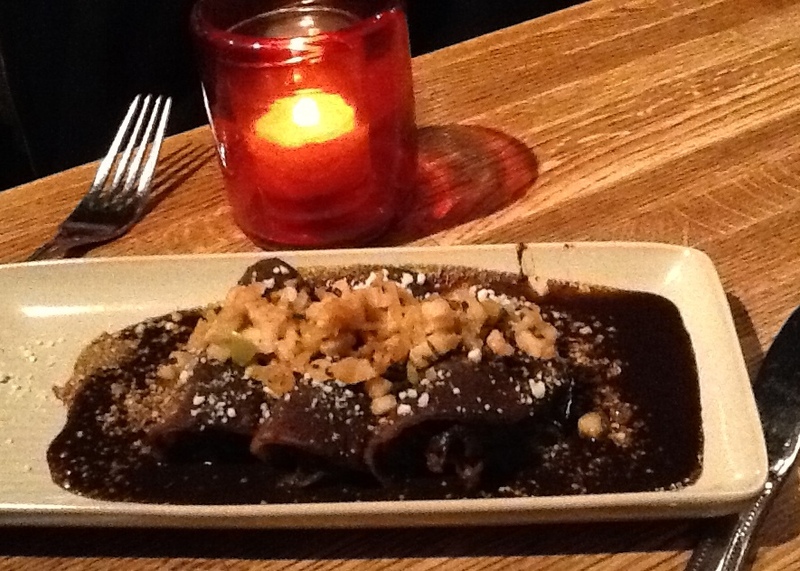 The mole encased the enchiladas with a deep, rich flavor of the 20+ ingredients that the Bayless mole is famous for. Sitting atop of the covered enchiladas were small cubes of jicama. The boldness of the flavors increased with each taste. When you finished the dish there was a slight spice after-burn which was light and pleasant. 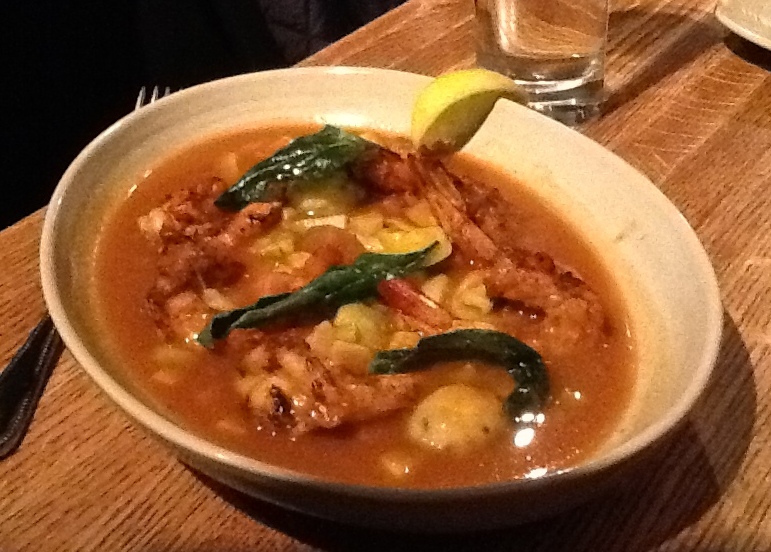 The Shrimp in Chilachole was comprised of adobo-marinated Gulf shrimp, chilpachole (silky lobster broth infused with roasted tomato, chipotle, epazote), little crab-masa dumplings (chochoyotes), roasted chayote, confit radish, and a few crispy epazote leaves. This was the dish recommended by the server and I was extremely grateful for his honestly and his palate. It was so complex in flavors and each bite brought differing flavors, textures and spice. 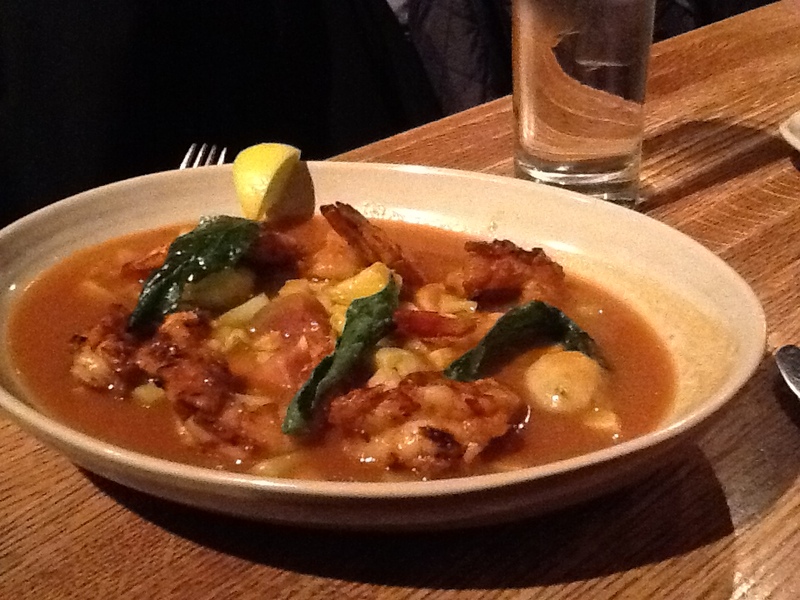 The marinade created a delicious flavor to the moist shrimp and the dumplings were like none I have tasted, almost a Mexican gnocchi in its texture. The diced vegetables were crunchy and flavorful and all of the ingredients were complemented by a slightly spicy sauce. A side of soft tacos are included to assist in enjoying as much of the sauce as possible. Overall I place my three course culinary extravaganza as one of the most extraordinary exploration of flavors, many I have never tasted before. The complexity of the dishes, the balancing of the heat with the depth of flavors fully support the well agreed to opinion that Rick Bayless is a genius with flavor combinations and a perfectionist in execution. Hudson Grille is receiving some press so I decided to see what all the hub-bub was about, and after my burger today I still have the same question. Yes the place has a great location, yes the place is incredibly cool inside and yes the staff is extremely nice, but at the end of the day the food draws me; if the hamburger is any indication, there are too many other places around that do it better. 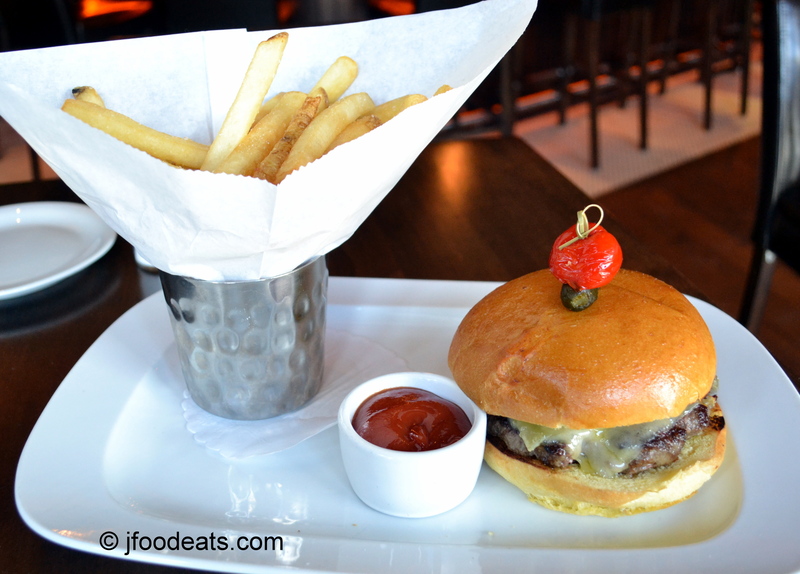 I ordered the HUDSON GRILL (sic) BURGER with Comte cheese, caramelized onion, bacon aioli, brioche roll and fries. This sounded like a tremendous combo. The requested doneness was medium rare. As you can see from my photo the delivery is picture-perfect, nicely stacked, fries in a pretty neat cone and a little cup of ketchup. The cheese sat atop the meat and there was a modest amount of onions. The bacon aioli was missing. Now onto the hamburger. The meat was pretty basic meat, nothing special. It was cooked to my requested medium rare and had a good char on the exterior. 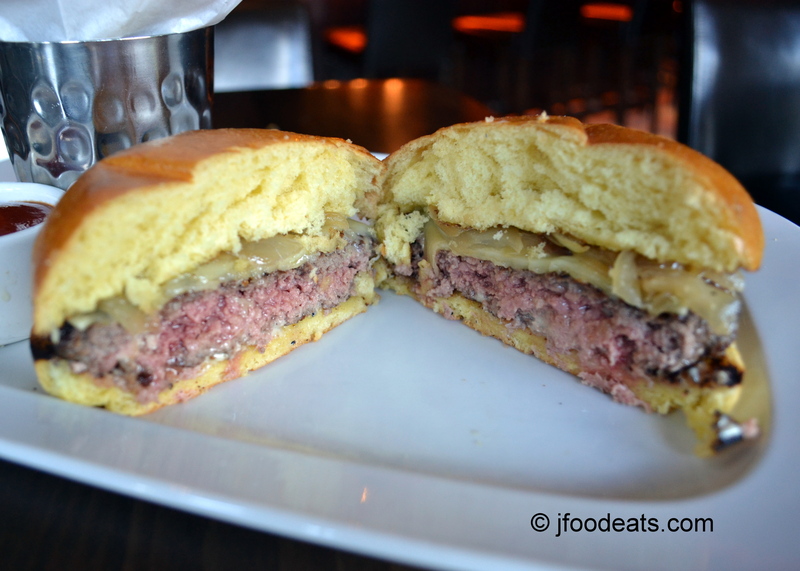 When I cut it in half, not one ounce of juice flowed out of the burger, not a good sign. One taste confirmed my fear, no juiciness; it was bland, not seasoned at all and dry. The accompaniments were equal to the meat. The “caramelized” onions were not; probably raw twenty minutes earlier, they were crunchy, pungent and were basic grilled onions, why restaurants call grilled onions “caramelized” baffles me, please just call them grilled. The Comte cheese was also not as expected. It was lacking flavor and added nothing to the overall taste. Likewise the bun could have been fresher. I ate half of the burger and decided that it was just not worth the effort. Maybe some of the other items are better, but I would not make a special effort to go to Hudson Grille for the Hudson Grill (sic) Burger.